If you're unfamiliar with the species, you may envision the grizzly bear as being a massive and intimidating creature that feeds exclusively on meat. That isn't reality. Grizzly bears do indeed eat meat, but they are omnivorous creatures and therefore chow down on a lot of other things, too. Species Ursus arctos horribilis is omnivorous. Grizzlies eat a wide array of animals, plants and bugs. Grizzly bears frequently engage in scavenging behavior and spend the majority of their days on the lookout for sustenance, whether it comes from a household garbage can or from a plant. Due to their massive body size, grizzly bears are big eaters. A grizzly can gain between 3 and 6 pounds in a day, according to website of the Department of Education and Early Childhood Development for Prince Edward Island. The bulk of a grizzly bear's diet consists of insects, berries, sedges, grass, tubers, roots and phorbs, or broad-leaved herbs, the United States Fish and Wildlife Service reports. These elements are the foundation of a grizzly bear's daily nourishment. Apart from the basics, grizzly bears also frequently feast on fish such as salmon as well as on marmots, moose, deer, caribou, bison, ground squirrels, elk and mice. Rotting animal carcasses are a relatively common part of the grizzly diet. Grizzly bears sometimes set their sights on domestic livestock for purposes of consumption -- think cows and sheep, for a couple of examples. According to the National Wildlife Federation, such livestock consumption can be economically destructive for livestock farmers, especially if it gets excessive. Salmon is a vital component in many grizzly bear diets during the summer months. 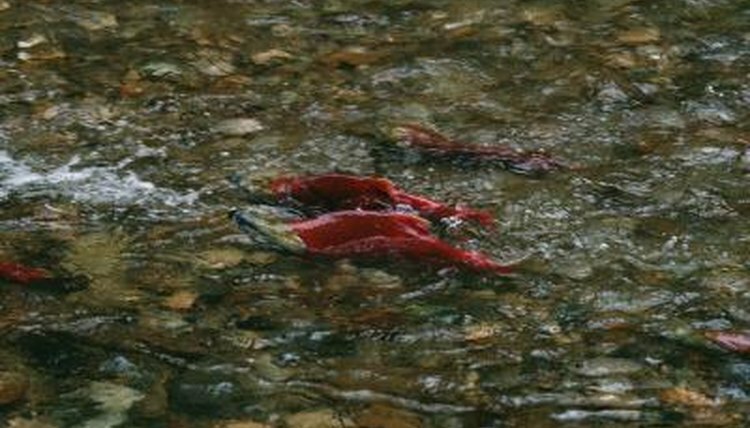 Fish such as salmon are packed with fatty acids, which are extremely beneficial for bears in the wintertime. Bears spend approximately half the year in hibernation and therefore need to consume a lot of fat to survive the winter season. According to "National Geographic," grizzly bears are prevalent in fishing areas during summer spawning. U.S. Fish and Wildlife Service: What Do Grizzly Bears Eat?